Nothing says Chinese New Year like a bright red lantern. It bobs and shines its good luck message. 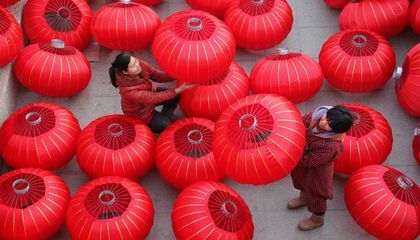 For many, these iconic lanterns are identified with China. Each year, China's annual lantern festival brings more awareness to the traditional form of lighting. Chinese New Year falls on Jan. 28 this year. The lantern festival will take place on Feb. 11. For China's lantern makers, it's right around the corner. 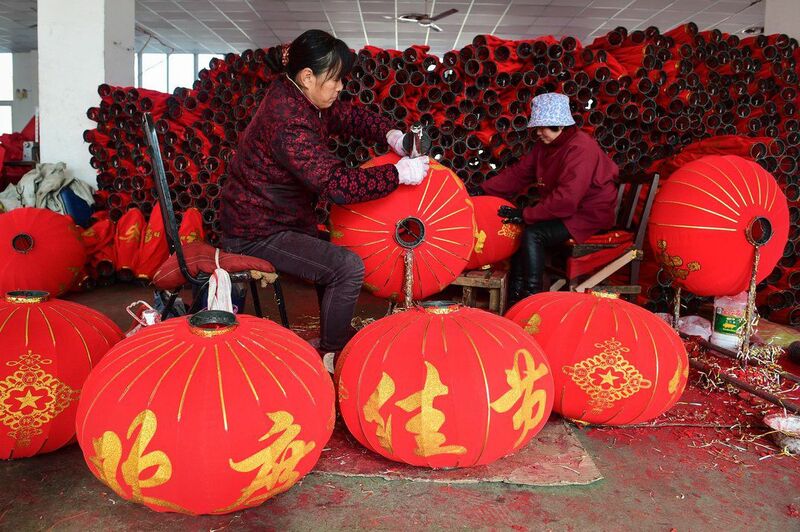 The Agence France-Presse writes that lantern makers in China's self-proclaimed "lantern capital," the village of Tuntou, in Hebei province, are working overtime. They must make thousands of handmade lanterns in time for the holiday season. Tuntou has a long history of lantern making. China Central Television reports that the village has produced lanterns since the 18th century. Artisans spend a lifetime working on their craft. Then they pass along their skills to their relatives. Tuntou has cornered an estimated 70 percent of the domestic market, CCTV writes. China's annual lantern output is staggering. It is estimated to be in the tens of millions. They are built in both large and small factories. The push isn't just for Chinese New Year. The lanterns are used for other celebrations, too. But Chinese New Year is the granddaddy of all lantern holidays. The color red symbolizes good luck in Chinese culture. And many lanterns are painted with phrases in Chinese. Tuntou's Communist leader tells the AFP that most lanterns are now decorated with "socialist core values" slogans that reflect Xi Jinping's priorities. Xi Jinping is the leader of the entire country of China. His priorities are said to be prosperity, democracy, civility, freedom, equality and harmony. They also include justice, the rule of law, patriotism, dedication, integrity and friendship. But on China's Weibo microblogs, 90 percent of online comments about the slogans are negative, reports the Asahi Shimbun. Whether you see them as political statements or just pretty objects, one thing is for sure. It is that China's lantern industry isn't slowing down any time soon. Can a ski resort have too much snow? Why are 90 percent of online comments about the slogans negative? A lot of the comments are negative because people think they are related to the political statements going on. I think that the lanterns are very pretty and are a symbol of good luck in a holiday. They shouldnt be commented on negatively. 90% of online comments about the slogans negative because china is becoming our enemy. They are decorated with socialist values slogans. That reflects XI Jinping's priorities. He is the leader is of the entire country of China. All the comments are negative. His Priorities are said to be prosperity. In response to, "China's lantern makers are gearing up for the New Year" I think that it is very cool that China lets millions of lanterns into the sky but, it could catch on fire and when they fall, it causes pollution. It is also tons of work. The article says, "It is estimated to be in the tens of millions." It must take a very long time to make all of them. They also have to work overtime. The article also says, "The Agence France-Presse writes that lantern makers in China's self-proclaimed "lantern capital," the village of Tuntou, in Hebei province, are working overtime." Many people have been working for months to prepare for this magical night. Although it is an amazing night, it causes lots of stress and work. In response to "China's lantern makers are geaing up for the new year," I agree that making lanterns is hard. One reason I agree is that they spend many months making the lanterns to celebrate the Chinese New Year. Another reason is that they have to make thousands of lanterns. It says in the article "Tun-tou has a long history of lantern making". A third reason is that the Chinese lantern festival falls on February 11th this year. That doesn't give lantern makers a lot of time to make their lanterns for the season. Even though some people may think that the lantern people have it easy, I think their job is a lot harder than you would think. I find it very interesting that other humans have their own completely different way of celebrating the new year. Americans just wait for a ball or something. I enjoyed reading over this topic. It was a neat idea to hear about this because I don't study much about china's culture. I never realized that American's have an affect on china's agriculture too. It takes very hard work to achieve this kind of job for millions of people as well. Basically it is something they do each year set millions of lanterns in there sky each Chinese new year. in the text it says "Chinese lantern makers are ready" and "It is estimated to be tens of millions" now I don't know if they pay these people enough to make all those lanterns but that's a lot of lanterns. but for Chinese new year it makes sense. It's pretty cool that this tradition has been kept up throughout the years. The only thing that I don't quite understand is how their new years works. If it is on January 28th, than how do their years work in accordance to ours? I mean I suppose it doesn't really matter. It's also cool that many people in the U.S. have begun to do this as well.